Japan is a major economic power in the modern world. Currently, its economy is the third largest in the entire world and exceeded only by those of the USA and The Peoples Republic of China. But as well as being one of the most economically and technologically advanced countries, Japan is also among the most volcanically active countries in the world. Recently, the Japanese volcanoes have only produced smaller eruptions. The most recent VEI 5 was 250 years ago. The last VEI 7 (Kikai) occured 6,400 years ago. However, with a volcanic chain some 2,500 km long, fuelled by several subducting plates, the potential for large eruptions clearly exists. The 1792 eruption and flank collapse of Mount Unzen caused 15,000 casualties. Further evidence for destructive potential comes from a number of large calderas. On the world volcanic threat index, Japan is ranked third, after Indonesia (of course) and the Philippines. This index takes into account volcanic hazards, number of volcanoes, and population density within 30 km of a volcano. The submerged Kikai-Akahoya caldera is 17 by 20 km across: it was formed by a VEI 7 eruption around 4,550 BC which spread ash across Japan, and pyroclastics over much of Kyushu. Ignimbrite deposits dated at 140,000 and 95,000 BP show that there had been similar eruptions before. 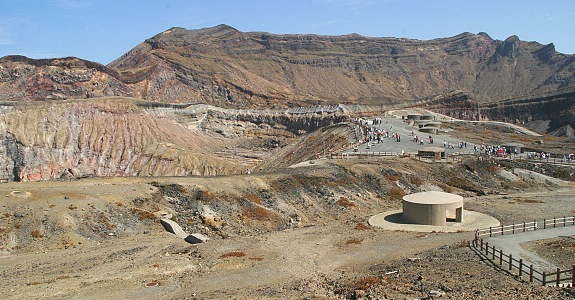 Ata caldera is a 25 by 12 km submarine caldera which has been dated at 105,000 BP. It contains a small caldera, 4 by 3 km, from an explosion only some 4,000 years ago. The Aira caldera, 80 km north of Kikai along the same graben, is 23 by 17 km in extent and formed at 22,000 BP. A second eruption 16,000 BP formed the 5-km Wakamiko caldera. Aira hosts the highly active volcano Sakura-Jima on its edge. Aira caldera is accumulating deep magma at a rate of 100 km3 over 10,000 yr (eg. a potential VEI 7 every 10,000 years). The shallow magma reservoir underneath Sakura-Jima, connected to the deeper reservoir, is gaining mass at about a third of this rate. Kakuto caldera is 15 by 10 km; it is approximately 110,000 years old but appears to be double: its western side is now thought to be a separate caldera called Kobyashi which may be 65,000 or even 120,000 years old. 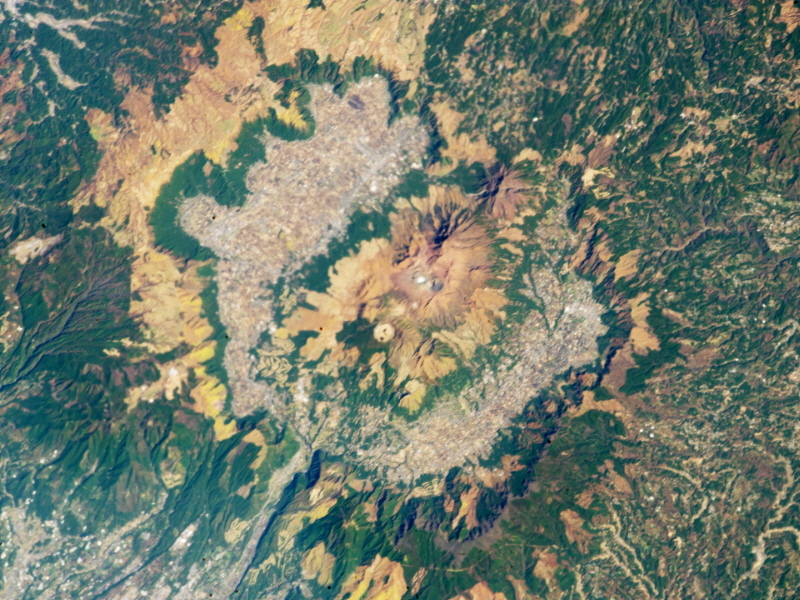 Kakuto contains the more recent Kirishima volcano on its southeastern edge, which itself has built a 20 km wide volcanic zone and should be considered a risk for a future caldera events. Aso caldera is the largest, at 25 by 18 km, and the oldest, formed by four eruptions dated between 270 to 90 thousand years ago. Unlike the other calderas, it is crossed by a major tectonic line, the Oita-Kumamoto Tectonic Line. Together, the calderas have produced an estimated 1,580 km3 of magma over 300,000 years. About half of this was erupted from Aso. The average rate of magma eruption is 0.005 km3 per year, a little more than Yellowstone and a little less than Taupo. All calderas are visible in maps of heat flow on the surface: this shows that magma chambers still exist and thus, the possibility of further great eruptions. The volcanic arc is caused by the subduction of the Philippine Sea plate underneath the Eurasian plate. This plate subducts in two zones, the southern Ryuku trench, with normal subduction, and the northern Nankai trough where subduction is at an angle with shear (sideways) movement. Kyushu lies near the junction of these two. 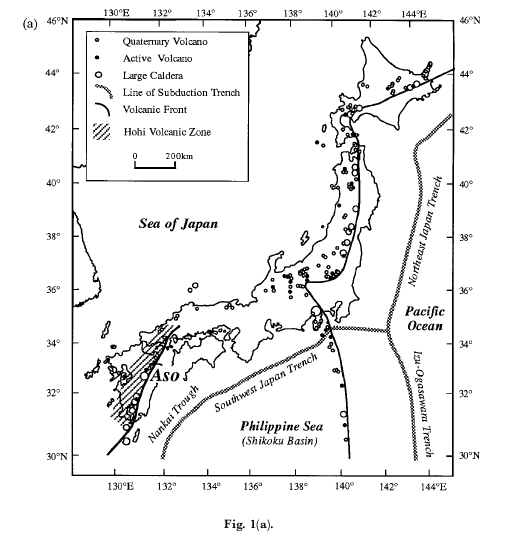 The subduction (re-)started about 6 million years ago when the Philippine Sea plate began to move north. This caused north-south extension (stretching) in central Kyushu, which resulted in a depression 70 by 40 km wide, called the Hohi volcanic zone. Mount Aso is located at the southern edge of this zone. Large scale fissure eruptions built up large lava plateaus. The Philippine Sea plate began to move more to the west about 1.5 to 2 million years ago, possibly related to the Eurasian plate beginning to move east at this time, pushed by the Baikal rift. This diminished the north-south extension and volcanism changed character. Volcanoes in Kyushu had begun to build from about 3 million years ago but when the plate turned to the west, they began to align with the subduction zone. Large pyroclastic eruptions started at about 1.3 million years ago. To the south of Kyushu, rifting began, also about 2 million years ago (currently terminating in the Kagoshima graben, at the southern tip of Kyushu). This pushed the South Kyushu microplate into a counter-clockwise rotation. So far it has rotated by about 30 degrees. At the same time, shear developed to the north and east (the Median Tectonic Line) due to the oblique movement of the subducting plate. The two motions, rotation to the south and accelerating shear to the north, meet in central Kyushu. Volcanoes here are strongly affected by tectonic stress! Activity at Aso began with basaltic eruptions, 2.2 million years ago. Intermittent eruptions continued but over time became more explosive, with pyroclastic and rhyolitic deposits. The major caldera explosions began 300 thousand years ago, when the crust began to be compressed by the tectonic stress. Previously crust extension had been more dominant. The caldera formed in four huge eruptions dated at 270, 140, 120 and 90 thousand years ago. The first one was the smallest and the last one the largest. Two flank volcanoes, Akai and Omine, 20 km west and southwest of the caldera, lie along a fault extending from Aso towards Kumamoto City. Their lava shows composition indistinguishable from the caldera eruption and they were fed by the same magma chamber. Since the caldera formation more than seventeen new eruption cones have formed in its centre. The five main cones are Neko, Taka (the highest, just under 1600 meters), Naka-Dake, Eboshi, and Mt. Kishima. 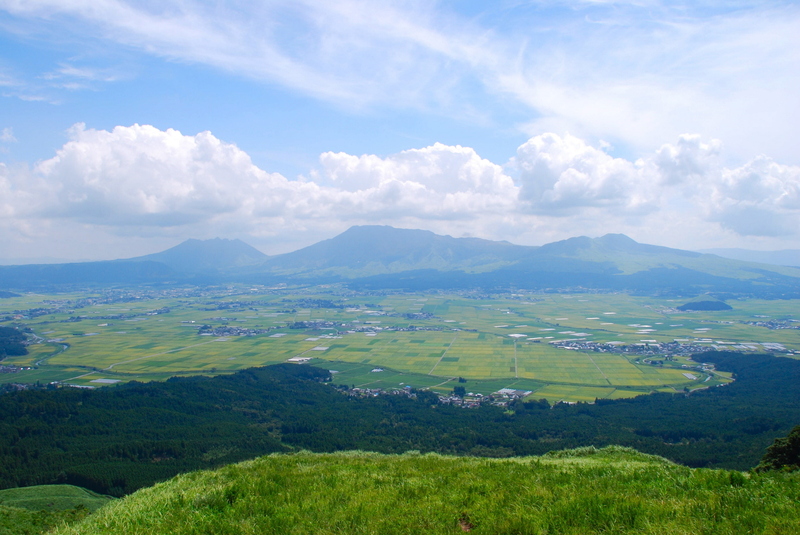 Together these are called Mount Aso. Only Naka-Dake is currently active: it has erupted 167 times from seven different craters since 553 CE. The on-going eruption, from the most northerly of its craters, started in Nov 2014. Of the smaller cones, Kometsuka basaltic scoria cone, 10,000 years old, and Kishima-Dake, 3700 years, are also classified as active. The number of cones shows that the magma travels easily here. The lavas from Aso show strontium-rich Adakites. These come from subduction where the subducting plate was itself young, and therefore still hot. The magmas are also very water-rich. The magma chamber underneath the main peaks is about 6 km deep, extends down to 10 km, and is 4-7 km wide. But there are deeper magma sources. A sill has been reported at 15 km depth, causing pressure over a large area, and a low velocity layer at 10-24 km depth, and finally a hot, melted region located at 30 km deep, which may be caused by a mantle wedge. This wedge is reported as being “serpentinised”, a metamorphic mineralization process where mafic and ultramafic rocks mainly constituted of the minerals Forsterite and Fayalite metamorphose into Aqueous Silica, Serpentine and Brucite by the assimilation of water. Basically, every three molecules of Fayalite bind two molecules of water. Forsterite can either turn into Serpentine where every three molecules assimilate four of water, or Brucite where two molecules of Forsterite assimilates three of water. Why is this so dangerous? Consider a slab of serpentinised rock several hundred if not thousands of cubic kilometres of these minerals and the location; in the top of the mantle at temperatures well in excess of 1200 degrees Celsius! The water liberated from its chemical bindings as the slab melts back into basalt act as a flux, melting the overlying continental crust and forming large quantities of silica-rich, evolved magmas (dacite, rhyolite). The explosive potential is tremendous as at those temperatures and pressures, superheated water that flashes into steam expands up to 10,000 times in volume. This is one reason why the volcanoes of Kyushu are so explosive and why there is a very real potential for very large, caldera-forming eruptions in the near geological future, especially at Aso. 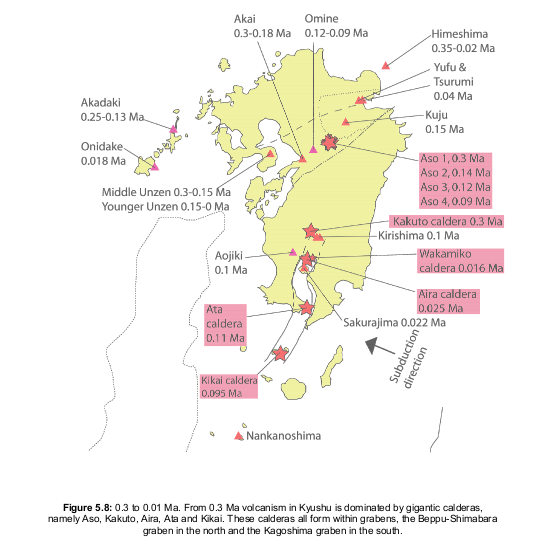 The calderas of Kyushu tend to be multiple: a new centre develops, perhaps on the edge of the previous caldera, which goes through its own cycle of growth and collapse. This is most clearly seen in Aira, with a secondary caldera, and in the double caldera of Kakuto. It grows and falls – and falls again. A larger eruption can wipe out an older, smaller caldera: this may have happened in Aso where the most recent eruption at 90 kA BP was the largest. Caldera eruptions have continued elsewhere in the arc until the present day. 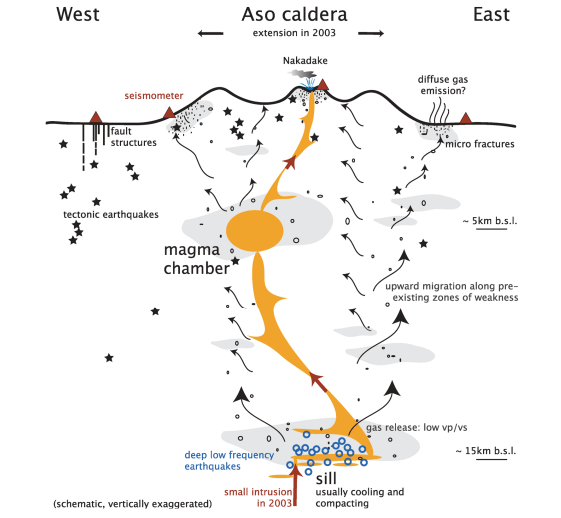 It would therefore be optimistic to assume that Aso is safely in its post-caldera phase. The large number of eruption sites over a large area within the caldera, and the continuing activity, show that the ingredients for large eruptions are still present. Each of the large caldera eruptions started with evolved, crystallized magma and moved to more juvenile magma. This suggests a large reservoir of magma. Seismology data suggests that beneath Aso is a “hot zone” of primed mantle. Whether this is part of an even larger magma chamber is an open question. The long recurrence time is an indication of the potential. Statistically, the longer the time between repeat eruptions, the larger the eruption can be. Statistics of known eruptions indicate that for eruptions of size VEI7.5, the repeat period is 40,000 yr. Thus, an eruption larger than this is theoretically possible in Aso. The terrain around Mt Aso is open only to the west. Should the potential VEI 7.5 eruption materialise, most of Kumamoto Prefecture (pop 1.8 million) would be covered by ignimbrites and be a non-survival zone. Nagasaki Prefecture 80 km to the west (pop. 1.4 million) would be at very great risk as well as Saga Prefecture (pop 0.85 million) to the northwest across the Ariake Sea. Kyushu is a densely populated area. With the large, caldera-forming eruption Aso is capable of, ignimbrites would travel in excess of 50 km from the vent and the shape of the terrain; open to the west, would act as a funnel so that not only would the entire Kumamoto province be within the zone of 0% survivability but also Nagasaki Prefecture at 80 km distance with its 446,000 inhabitants would also be at great risk as well as the Saga Prefecture (pop. 0.85 million) about 100 km to the northwest. There has never been a VEI 7-sized eruption in a modern, developed country. The world has gone through a quiet spell, volcano-wise, over the past 150 years. We do not know how resilient our society is to a Tambora-sized eruption. That one will happen is certain. Japan is a likely place where this will occur, because of its sheer number of volcanoes. Mt Aso is a particular worry because of its history, location, and magma reservoir that one publication describes as ‘charged’. It is well to remember that as a result of the Fukushima disaster in March 2011, an area of land some 310 square kilometres in extent was rendered uninhabitable, 160,000 people were evacuated permanently and the total cost estimated at between $250-300 billion. This pales into insignificance compared to the devastation a VEI 7 could cause. First of all, the death toll would be horrendous unless millions could be evacuated in advance – to where and for how long? Second, the area covered by ignimbrites would most likely exceed 7,500 square kilometres, 25 times the area rendered uninhabitable by Fukushima and be just as effectively rendered uninhabitable for the foreseeable future. The area covered by ash from pyroclastic flows or deposited aerially to depths between 1 and 100 cm, thus rendered useless for agricultural purposes for a period of time ranging from a year up to several decades, would be far greater. Just to provide a simple, everyday necessity such as potable water could turn out to be such a problem that a very large segment of the population of Kyushu might have to be evacuated on that count alone until infrastructures for water purification had been installed. There are other Japanese volcanoes which may be equally dangerous, but perhaps not recognized as such. Are we prepared? On Aso I’ll say this much; I have had it conveyed to me that Japanese volcanologists are, privately, seriously concerned about its potential – in the *short* term. Definitely one to watch. It was surprisingly hard to find good information on Aso. Who is watching? Regarding the comments on Fukushima I’ll simply point to this, by an Oxford physics prof. The Japanese authorities have massively, grossly, overreacted to this accident – and their overreaction has been FAR more dangerous to people than the accident itself. There is a lot of irrational scare about nuclear energy, and levels of natural radiation can be forgotten about. But this talk is not without an agenda and bias either. I have seen exactly the same arguments made about chemicals (by the companies that make them ,either direct or through research funded by them) regarding their safety. That turned out to be nonsense. The drastic decline of farm birds and insects, through ‘safe’ chemicals comes to mind. How can imidacloprid kill so effectively and supposedly be harmless to us? When so much money is involved, can we be sure that all tests have been made public? With radiation, it is best to err on the side of caution. I don’t trust the other side. The Fukushima evacuation zone may be overkill (forgive the word). The Chernobyl one is certainly not. One thing worth mentioning about evacuation in the event of a serious eruption here that scares me. Kyushu is an island. It’s a very big island, but an island nonetheless. When you have an eruption that could presumably send pyroclastic flows across nearly 1/3 to 1/2 of the island, you start to realize that there isn’t any real mitigation that could effectively be done unless you evacuate all of Kyushu every time a possible large eruption may occur (and there is no surefire way to know this). In order to get out of Kyushu in the event of an eruption, you would either need to cross the one single bridge to Hokkaido, would need to Fly (which isnt great in the event of an eruption), or find a boat. You could try to wait things out in Hokkaido, but considering how far the pyroclastic flows have historically traveled during the VEI-7 Kyushu eruptions, and how insanely heavy the ashfall would be across the entirely island, you would start to wonder how survivable it would be for those who didnt evacuate the island entirely. Now, this isn’t a likely scenario in our lifetimes since VEI-7 eruptions are pretty rare. But at some point the future of humanity, it is extremely likely that we will have to deal with this scenario, which is pretty frightening. Good points! And how do you supply the day-to-day basics to those survivors trapped on Kyushu after such an eruption? I suppose a couple of tankers could be fitted out to ferry the 5,000 m^3 of potable water per million inhabitants necessary per day, but how do you distribute it further with roads completely impassable and helicopter landings impossible? I’ll reference this quote from the GVP regarding Kikai, which is the south of Kyushu, but part of a similar system. The thought that a volcano 100 km away could send pyroclastic flows this far, so as to render south and central Kyushu uninhabitable for centuries is pretty mind-blowing. Given, these flows were aided by water, but you could only imagine what would happen if a similar eruption were to occur in the very center of the island. How old is Kikai? If the rhyolite has come from melted continental crust as the volcano formed, she might switch to more dacite / andesitic lavas as she evolves. Not much comfort if her next eruptions are rhyolitc though. Scrub that. She seems to be on oceanic crust, according to GVP. Odd then that she is so rhyolitic. OK, where is the oceanic crust coming from? Kikai is on the Okinawa Plate, which is continental crust. A lot of people on Sumbawa survived the eruption, itself, of Tambora (VEI-7). It was contaminated water supplies and famine that were the bigger problems. Contingency planning could save some from contaminated water and loss of crops. This is a good point, but I would also point out that the Aso eruption (Aso-4) is a completely different animal when compared to Tambora. The ash fallout itself is a major concern, not just for Kyushu, but for the rest of Japan as well. It wouldn’t be out of the question to assume that almost the entirety of Japan would experience crop failure and significant water contamination in the event of an ASO-4 sized eruption. I say this from the point that the ash fallout deposits are 15 centimeters thick at the northernmost part of Japan’s main islands. In Kyushu, the ash would likely be meters thick at the very least. Ash this thick would make travel impossible, and would cause a very large portion of buildings to collapse under the massive weight of the ash itself. It would all depend on the size of the eruption and the prevailing winds. For all we know, the next eruption may be no more than a VEI 5.5 Plinian and the ash blown west out over the China Sea in which case it’s certainly dire but nowhere near the full-blown, worst-case scenario. Crop failure could be widespread. Going back to Tambora again, Tambora has been credited with causing failure of the rice crops in China that year, even though there was no reported ashfall there. It is possible that our modern society is better able to cope with this. But that is not proven. Modern society brings in most of our needs (food, water, fuel) over long distances, delivering it ‘just in time’. If this distribution system fails, there is little time to get things working again before shortages become urgent. Katrina comes to mind. Mind you, contaminated water supplies are just as disastrous if the supply is local. And that is the reason that I always have extra unscented bleach around… plus about 10 pounds of activated charcoal. This is to augment my 15 gallons of potable water should it run out. So this is #4…. I can’t imagine there are three worse scenarios..
Trust me Bill, there are. One marginally more so, one decidedly worse and the final one so utterly mind-blowing that eventually Hollywood will make a blockbuster movie of it. I have been Lurking…… No. Not stealing another’s identity. I am just having a bad patch and I am still here. Thanks to all who have been enquiring… Hopefully I will soon be back on form. My problems are small compared with others and at least I don’t have a whalloping great Volcano about to devastate my home and disrupt my life. my computer guy is getting help from Toshiba and I may get a very good deal from them. Anyway hope to post more.. Here is a bit from a SEAT (Single-Engine Airtankers) dropping on a fire south east of here. Typical Eastern Oregon country. One of these days …..
My only issue with Toshiba was when they listed my house as a depot level repair facility on their website. Wound up with a lady at my front door one Saturday morning seeking warranty repair on a laptop. (I just do contracted field work) However, I have been inside a lot of Toshiba equipment, and my general impression is that it is well made. Some time ago, my grandson killed a friend of his laptop and cracked the display. I had him order the panel and did the repair work for him in exchange for some indentured servitude on the yard. Based on my experiences inside that machine, I bought that same model as my next laptop when my Netbook croaked. that was bulletproof. Heck, mine was near 8 years old and this was the first real trouble for it. She was ex-USAF and used Toshiba in the military. As did my retired Coast Guard co-worker in that same office. Forestry around here tends to use a few ruggedized Dells. Those are a mother to get into and out of. There is one wandering around this district that took a dive off the back of a scooter at 70 mph (per their IT guy) and has been hit by lightning a couple of times. (each incident requiring some repair). But it’s still working…. (sort of). The Dells that they have that have given me the most trouble are the ones that the LCD panel has gotten so old that the adhesive is bubbling up. That goo will stick to anything, instantly bonding any tiny screws you might touch to your fingers quite well, plus, the goop smells like gin. If you loose a screw, check your hands, it might be stuck to the back of your finger. Too much of my life has been spent fixing drives, mother boards, viruses, waiting to boot, spending bucks. A top-end Chromebox costs $250 plus monitor. All software included. I’m pretty sure Google isn’t going under soon. I know GeoLurking thinks you’re vulnerable to data mining, but do you really think your on-line windows computer is safe? No, I don’t. But I’m not going to waltz out into the street and drop my trousers because of it. As for Windows 10… I have been having a really pervasive issue nagging in the back of my mind. No, I don’t have any evidence of it what-so-ever, but what if… Window’s 10 is so connected, that when you are online, you are just a node in a large distributed processing array and you’re unused CPU power is being sold to “Cloud Computing” customers of Microsoft? … and yes, this could be just as valid for the Chrome Box. In fact, that would play right into the Google mantra. In this case “No I don’t ” is meant to covey that I don’t think that anyone is immune to data mining. The issue comes to a head when you realize how much it would cost you in experts to prove that whatever it is was placed there illicitly… possibly as planted evidence. The best tactic is to reduce the vulnerability by having less than easy systems to compromise. Idealy, none, but that would make me a luddite. I am here also, 6 weeks ago my 2yr old that likes grass, hay and carrots was attacked by my (neighbor from hell) dogs, I’m just too old for this BS. Little guy is healing and doing fine but this took years of my life. Just an FYI, unusually, Nishinoshima go boom – to 20,000ft! Back in the 90’s when I did my rounds of several Japanese volcanoes, Aso, well more specifically Nakadake always struck me as the most sinister, but it was by far the easiest to get to, as the tour bus from the railway station – I took the old Aso-san steam train from Kumamoto -. drops you off right at the crater. At the time it was a filled with large seething pool of boiling iridescent water. The rebuilt concrete shelters seen in the photo were also mostly rubble amid large tossed blocks. Most of the other peaks were both more difficult to reach, requiring some hiking, and were more subtle about their intentions – little wisps of vapor from cracks in the rocks, or a few sulphur encrusted fumaroles in a valley. What other Japanese volcanoes did you visit and what were your impressions? Some good views of Cotopaxi at the moment. Still huffing and puffing along. Lots of haze downwind. Given all this activity we’ve seen at Cotopaxi, is there even a chance of a single large eruption anymore? Wondering the same thing. Are long period events going on? It looked ashy on the webcam. Temperatures of emissions have gradually increased from 45 C to about 200 C on occasions. Hot spots have been observed on side of volcanic cone. They describe them as “termales” which translates to hot spots or hot springs. The glacier on top has lost quite a bit of volume due to melting especially now that temperatures of the emissions are rising. Georges makes no statement about future of eruption. However, the data suggests things are hotting up a bit. Exactly! As was said at the start; low level eruptions for a long period of time was to be hoped for. Great article and summary by Georges. I think its tough for anybody to gauge what will happen here. I wouldnt be surprised if Cotopaxi just slowly fizzled out after puffing away for another month or so. At the same point, this could just be a gradual vent clearing. There is just too much uncertainty. While a gradual reduction in the glacier would be ideal, it would be somewhat naive to think that this activity could gradually melt the glacier enough that we would have no lahar threat. The only glacier that has had any slightly significant melting is the glacier thats located directly inside the summit crater, and even that has only melted a little bit. If we are going to avoid a lahar from glacial melting, it will be a result of no larger eruption occurring, not because the glacier has melted off enough prior to a larger eruption occurring. With volcanoes, who knows? Today, at 15:58 UT, there was an unusually strong earthquake (BREF:BHZ) but what caused it and what does it signify? In general, one would think that the longer these low-level, almost continuous eruptions go on, the lesser the chance of a big one, but nothing is certain. Remember how everyone, from the geologists at the IMO to us laymen, expected Bardarbunga to have a large eruption (at least a VEI 3, probably VEI 4 and not impossibly VEI 5) that never materialised? Yes, that is good news for towns and villages in the area. I am particularly interesting in the situation there as my wife and younger son and I spent nearly 6 weeks in Ecuador including about a week in Quito. We spent the rest of the time exploring more remote areas. We have fond memories of this small country. In a nutshell, when the Cascadia subduction zone goes big, those who are quite lucky will have maybe… 15 minutes to get away from the coast. Failing to do that and it’s pretty much game over. when will that happen? Dunno, but it’s definitely within the normal behavior for the system. It’s just a matter of time. (and prevailing stress levels vs the various failure mechanisms of the fault) The downside is that the closer to the epicenter you are, the more likely that roads and bridges will be utterly destroyed before they can be used for escape. Like with most volcanoes, the key to survival is to not be there when it happens. And to offer up an often used Science Fiction authors comment; ‘All societies are just three missed meals from anarchy.’ My amateur estimates of the foragability of grocery stores points towards them lasting maybe three days. After that, it starts to get rough very fast. That’s if my estimate of one linear foot of shelf space supporting the caloric intake of 1000 people for one day… on average… with a just below basal metabolic rate consumption. I really need to go back and verify those estimates. It’s a very entertaining mental exercise. After about four days, the local farms around a catastrophe area will be likely be hit with roving hordes of hungry people. Those who hunt will quickly find the woods devoid of usable game. For this reason, if “hunting” is one of your plans of action… you had best re-think that option. High yield bovines such as the Auroch are no longer found in the wild. (they became our modern cattle) Even if a kill can be made, you are going to find yourself in the situation of a few thousand years ago… the kill will have to be processed and potentially stored, unless you have a large group, in which case the needs of your “tribe” are going to require organization and delegation of tasks and supportive activity to keep the group alive. That is not going to be an easy task, dealing with the proto-society developments and the constant shifts in power and alliances that go with it. When you sit back and think about it… modern society is in about as a precarious position as it could be in. Just in Time supply chains, monoculture, etc. I know I can last 4 weeks if I have a sack of potatoes, but I am not picky, and after 4 weeks, I don’t know what happens. Do I go feral? After Ivan, it took just a couple of days to get the roads near here clear enough for Police, Fire and Rescue to be able to get in and out. That was all done using local manpower. One of the reasons to keep a good chainsaw handy. The same thing happened up in Mississippi when Smith County got nailed by a tornado swarm. Initial road clearing was done by the local populace. In that case, we ate quite well until FEMA showed up. A local catfish place provided meals for those of us who were affected. After FEMA, cold cuts, dry bread and endless bureaucracy. The issue here is the inherent uncertainty. There is a list of potential disasters in the USA that are always looming, and have a somewhat small chance of occurring during any given year. These disasters range from “smaller” events such as flooding or smaller earthquakes in areas like the Carolinas, to larger disasters like a San Andreas or New Madrid large earthquake, a large-ish eruption at Rainier, a category 5 hurricane, or a cascadia tsunami. We know these events will happen in the future, but people see a small percentage for the current year and presume it best to ignore that threat. The issue is that when you add these threats up, and span it across 20 or so years, your small percentages turn from unlikely into a high likelihood of a big disaster coming at some point in the somewhat near future. Realistically, the big problem is that we’re not great at long-term planning as a country. Most countries aren’t, but I feel the USA is especially guilty of chasing after short-term gratification, both politically, as well as in the corporate world. Dunno. I have done some DR planning for business, including eqs on the San Andreas fault. People are well aware of what can happen. The San Andreas is one of the most well-known areas in the world in terms of disaster preparedness, but others aren’t so much. Also, there is a big difference between having mitigation in place, and voting on funding for said mitigation politically, and simply being aware of a potential disaster. Speaking of probability (and survivor functions) I have a 0.275% chance of dieing within a year… (mortality tables) but that doesn’t mean that I won’t be run over by a bus tomorrow. Life is a crapshoot, all you can do is lessen your exposure to risk. I would quote a line from “My Cousin Vinny” but that might be a bit abrasive. Let’s just say that I agree. … which also leads to the principle reason why I have not explored the foragabiliy of grocery stores any further… I get hyper depressed thinking about it. As a species, we are royally hosed. Honestly though, every one has their Black Dog… it’s just a matter of keeping it on it’s leash. A part of my earthquake kit when living near the San Andreas fault, I had to have at least three days supply of food (tinned and not requiring cooking), tin opener (manual not electric), water and a few other essentials my insurance company insisted on. Having seen recent large EQs, e.g the Ghorka eq, I’d make that provisions for at least a week, longer if you live somwhere remote. This is completely correct. Indeed supermarkets will be stripped of food within 12 hours. In the unlikely event of the authorities maintaining basic services there will be, if conserved with care, enough stored food destined for animal production to feed the population for some time. The animals will soon be eaten anyway. There is nothing wrong with food for animal consumption, its wholesome and safe. If it happens just after harvest (ie autmn) there may be enough food for two or three years, if just before harvest, it would be tight to survive until next year. 200 years ago populations were very much smaller and most of european (and probably world) farmed area was for livestock, and quite resistant to poor weather (grass grows even when its wet and cold). Today arable crops that cannot be harvested due cold, wet or contamination are essentially lost. Yeah the OWL is capable of coughing up a 7.0 furball, but not much more…I get nervous every time I get near the Oregon coast-or Washington’s for that matter..
After being quiet for most of the day Cotopaxi has begun a lively eruption about an hour ago. It is doing it again !! Pretty impressive. Wish there was a better webcam to watch. Earthquake data for Aso, available from the WOVOdat database http://www.wovodat.org/precursor/index_unrest_devel_v6.php. It covers a long time. The main plot shows the earthquakes are mainy from the caldera edge and from the central peak. 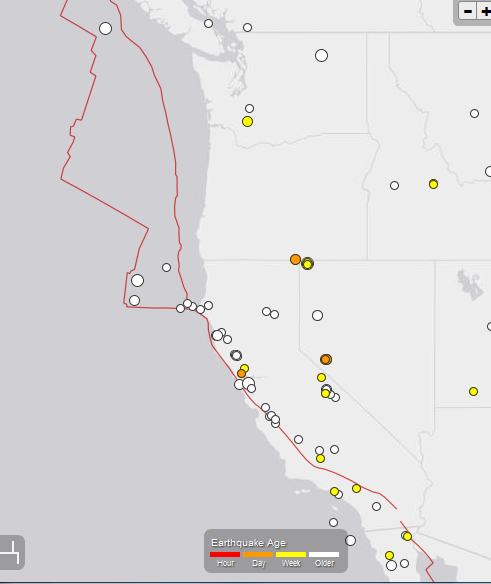 The two side plots show the depths: at the center there are quakes at 15-20km depth and shallow ones. Towards the edge of the caldera, the earthquakes are mainly at 5-10 km depth. The main magma chamber appears to be underneath the central peak, at 10-15 km, with a narrow conduit to the surface. The plot shows the earthquakes beginning around the year 2000 (bottom plot), but that I assume is when the seismographs were installed. There may be an indication that over the past ten years the earthquakes have slowly become a bit shallower. Apparently the activity we have been seeing so far at Cotopaxi might have been phreatic in origin, not magmatic. 😮 If that is true, then doesn’t that mean the pressure in the volcano hasn’t been released at all? And no, there likely is *some* pressure relieved, phreatic eruptions happen because magma is pushing into areas where the water table is. With that said, based on watching the output, there is likely very little pressure actually being relieved, as there hasn’t actually been a whole lot of eruptive material. And in the not related to volcanoes category… The modern hominid; Homo Stultus is alive and well. Escambia County jail staff accidentally turn the wrong prisoner loose. Luckily, the guy they released was only in on a shoplifting charge. They don’t typically get violent until they are being apprehended. Per the radio news bit about this, Jail staff realized their mistake and searched the local area but could not find him (like that’s a surprise) and have asked the Sheriff’s Dept for assistance. In addition to Aso, I visited Kirishima and Daisetsuzan parks. The wisps of vapor were a reference to the Ohachi crater at Kirishima, where at the time the only sign of activity was a thermal anomaly on the SE side of the crater. This was actually my first time on an any volcano and I remember being taken with how loose and unconsolidated everything was, the contrasting red and black tephra layers and how quickly the scenery changed form subtropical forest to barren moonscape. I had actually planned to go to Sakurajima that day but the ferry was not running, iirc because it was active at the time, but nothing visible from Kagoshima due to low overcast. Much further north, in Hokkaido I hiked across Daisetsuzan from Sounkyo Onsen. I had stayed there the previous night at a pleasant little ryokan with scalding hot volcanic sulphur water baths, and a very delicious breakfast. The traverse to Asahidake started with a ride up the ropeway in Sounkyo and a short climb up to the trail. There was still considerable snow on the ground (it was June! ), but temperatures were comfortable. On the hike across I ran into few signs of life, other than a curious fox (good because apparently the park is home to a sizeable population of bears). I remember when I got to the Asahi side being amused at the Japanese all burdened down with mountaineering equipment and huge packs, whereas this barbarian was in jeans & t-shirt with a reserve sweatshirt in the camera bag. On the western flank, descending from the peak toward the Asahidake lift, there is a valley filled with numerous fumaroles, with bright yellow encrustations of sulphur, and a very audible continuous hissing. The “fence” stopping folks gassing themselves in the valley was a mere set of roped stakes, easily stepped over. The valley itself is probably the result of a flank explosion. Mnt. Aso has erupted today, see http://www.wired.com/2015/09/new-eruption-rocks-aso-japan/ At https://www.youtube.com/watch?v=Z7RRrERYqjk&amp; from 3:25:00 you see the volcano erupting with black ash and a pyroclastic flow due to the collapse of the ash plume. But I haven’t found any scientific reports yet.